Hardening Furnace upto 1600°C for hardening, tempering, normalizing, sintering and annealing with brick insulation or vacuum formed ceramic fiber board based insulation or ceramic fiber based insulation can be used depending on the heating and cooling requirements of the product and process. Heating elements of various grades-from metallic wire based to silicon carbide, molybdenum wire and molybdenum disilicide can be used depending on application. We offer a wide gamut of muffle furnace, laboratory muffle furnace, industrial muffle furnace, mild steel muffle furnace that are available in different specifications. Our entire range is appreciated for their durability and sturdy construction. Following are the technical specifications. 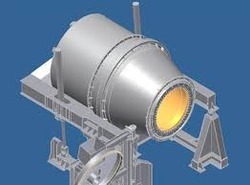 Light weight muffle furnace maximum temp: 950°C to 1500°C and working temp: 900°C to 1400°C. Controlled by sunvic energy regulator, outer body is made of thick mild steel sheet, with gray enamel paint. The apparatus is complete with pyrometer, thermocouple and a silver fuse wire is also provided for the safety of elements in case temp: rises above maximum. Aluminum Melting Furnace: We are leading manufacturers of high quality Aluminum furnaces; which are designed to serve various industrial purposes and include various elements like Fe, Al, Cr. Further, these elements have the support of different sorts of equipments. All these are very necessary for better heat distribution and ensure longer service life of the element. Our products are built from top notch technology and are available in various sizes and capacities. Our qualitative Electric Furnace is featured with temperature control and thermostat control system. It can operate easily on temperature range that varies from 0 to 300°C. Manufactured of high grade raw material, the oven provides solutions to various applications in diverse industries like spring tempering, paint baking, clutch plate baking, wax melting, PVC curing, water drying, powder coating, lacer and teflon coating and others. 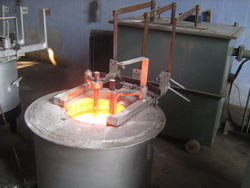 We have introduced the gold furnace which has absolutely simple operations & extremely low maintenance as well as the operation cost, to help increase the profit level of organization bit by bit. The entire manufacturing process and the materials used are carefully inspected to ensure completely defect. 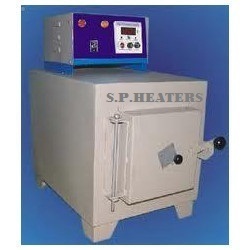 We also offer these furnace as per our client’s requirements. As an manufacturer and exporter of Aluminium Melting Furnace, we have marked our name very strongly in the market. 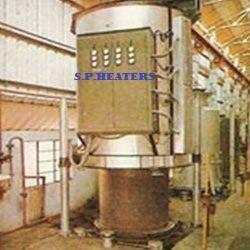 These have a melting chamber that is equipped with recuperator & burners. A mechanical or hydraulic arrangement can be used for tilting the melting chamber in order to discharge the molten metal. 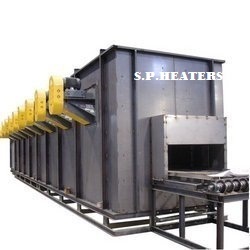 The main advantages of these furnace are these are pollution free furnace & also does not require much space for installation & it works automatically. 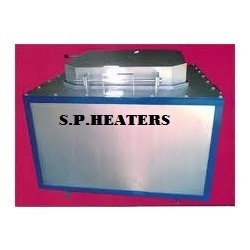 Due to internal heating, 20 to 30 % assured less production cost. 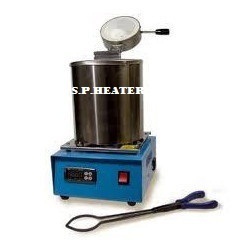 It also increases your pot life because in oil fired & other furnaces the pressure of heat use to be on one side & as a result after some time the pot gets leak from that particular point but in our furnace, due to uniform temperature, it increase the life of pot. Fully temp. automatic controlled as required. Easy to operate, low maintenance cost. Saves your labour & also your spacious in comparison. 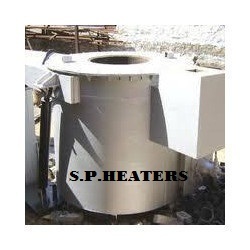 Our company has been dedicatedly manufacturing and exportingElectrode Salt Bath Furnace. 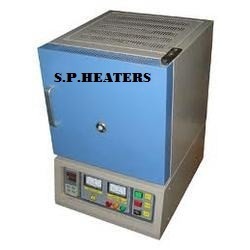 This furnace is fitted with its own separate heavy duty oil cooled step down double copper wound transformer manufactured with high grade silicon stamping sheets provided with suitable steps for heat adjustment, fitted in rigid steel body with cooling fins mounted on four wheels with attractive color. 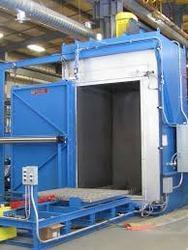 These salt bath furnaces are ideally suited for aluminum dip brazing operations. Replacement graphite electrode extensions are simply added by means of a connecting pin threaded into the rear of the electrode in service. 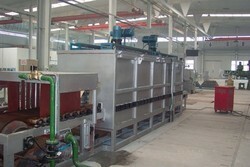 Looking for Industrial Furnace ?